What causes exocrine pancreatic insufficiency (EPI)? How is EPI diagnosed and treated? 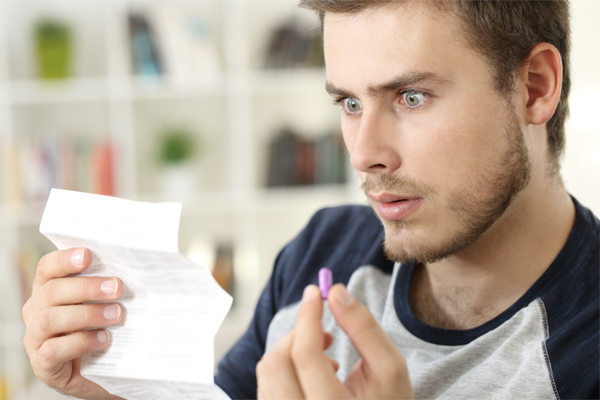 When should you take PERT and how do you calculate the correct dose? Is PERT helpful in treating the pain of chronic pancreatitis? How does PERT affect patients with diabetes? What new developments are in the pipeline to treat EPI? Dr. Freedman address these questions and more in this webinar replay as he debunks the myths and solves the mysteries that surround pancreatic insufficiency and pancreatic enzymes, followed by a robust Q & A session with pancreatitis patients who participated in the live webinar. On February 28, 2019, Rare Disease Day, an alliance of leading life-science companies, in partnership with Mission: Cure, announced the promising results of a 4-month “datathon” aimed at identifying potential treatments for chronic pancreatitis. Using artificial intelligence and statistical techniques, datathon participants identified 4 existing, approved drugs as repurposing candidates worth testing as possible cures for pancreatitis. The drugs identified are believed to address (target) specific defective genes or processes that lead to pancreatitis. Mission: Cure would like to thank its collaborators in the datathon: Elsevier, a data analytics firm that supplied the innovative artificial intelligence framework used in the datathon, the Pistoia Alliance, a nonprofit consortium founded by major life science companies that works to lower barriers to innovation, and Cures Within Reach, a nonprofit leader in research to apply already-approved drugs to treat new diseases. Two academic scientists played major roles in the project. Mission: Cure is grateful for their work and hopes to continue to collaborate with them. Dr. Bruce Aronow is the John Hutton MD Professor of Biomedical Informatics and Co-director of the Computational Medicine Center at Cincinnati Children’s and has developed a computable data model network for chronic pancreatitis that helped determine which drugs were most likely to correct the biological problems causing pancreatitis. Dr. Aleksandar Poleksic, Professor, University of Northern Iowa, used data science to predict which drug candidates would have the least side effects for patients. The success of this project highlights the role that partnering with pharma and life sciences companies and academic institutions can play in bringing us closer to discovering a cure. It is by pooling our expertise that we will achieve our mission and bring new treatments to those who need it the most. To get updates on Mission: Cure’s efforts to test these drugs and bring those that work to patients, sign up for Mission: Cure’s email list. If you think you have pancreatic insufficiency due to pancreatitis or another disorder, you won’t want to miss Mission: Cure’s next webinar. Get the information you need about exocrine pancreatic insufficiency (EPI) and whether and how you should take pancreatic enzymes. This will be the 5th webinar in our ongoing series for chronic pancreatitis and recurrent acute pancreatitis patients and their families. Many people with recurrent acute or chronic pancreatitis experience EPI, or exocrine pancreatic insufficiency. The treatment for EPI is pancreatic enzyme replacement therapy or PERT. Unfortunately, there remains much confusion about accurate diagnosing of EPI as well as proper dosing and administration of oral enzymes. Dr. Freedman will solve the mysteries that surround EPI and will provide factual, practical guidance on diagnosis and treatment. He will also address participant questions during a Q&A session. This webinar is brought to you by Mission: Cure, a nonprofit organization that aims to find a cure and improve the quality of life of those affected by pancreatitis by applying innovative financing to medical research and drug development. Even if you can’t make it to this webinar, please register so that we can send you the recording as soon as it becomes available. We then hear from Amy Jensen, a recent TPIAT patient, who eloquently shares her own TPIAT journey. The goal of this webinar was to educate chronic and recurrent acute pancreatitis patients and their families about Total Pancreatectomy with Islet Auto Transplantation surgery (TPIAT). The early reviews are in, and “YES,” these goals were met. Plus, we even made time for 20 or so questions! Listen to the replay, share with others and let us know which topics you want to hear about in future webinars. Curing Pancreatitis: It’s Time for a New Approach! On December 8th, Mission: Cure hosted an informational webinar for chronic and recurrent acute pancreatitis patients, their families and clinicians on their new approach to curing pancreatitis. It featured co-directors Megan Golden and Linda Martin, who gave presentations on the gap Mission: Cure is working to address, their innovative financing model, and how patients and families can get involved and help! Attendees gained unique insights to the projects Mission: Cure is spearheading to provide promising pathways toward effective treatments and cures. Do genetics cause chronic and recurrent acute pancreatitis? How will research on genetics help us find a cure? Mission: Cure and its partners are using new research on genetics to find pathways toward effective treatments. Mission: Cure believes that new innovations in medical research are key to achieving our goal of curing chronic pancreatitis. For this reason, we strive to leverage and support advances in genomics and precision medicine and aim to collaborate with forward-thinking and mission-driven organizations. Today, we are excited to announce our partnership with Perlara, a rare disease drug discovery platform company working with highly motivated families, foundations and drug developers. Together, we have formed a n=1 drug discovery PerlQuest pact with the goal of discovering promising compounds for rapid testing in patient-matched organoid models of pancreatitis to get treatments to patients faster. In Stage One of the PerlQuest, Perlara will engineer ∆F508 and 26 other CFTR disease-causing variants in yeast YOR1 models of CFTR deficiency with Mission: Cure’s support. The project will then involve completing drug repurposing and drug discovery screens with the ∆F508 model and another mutant, e.g., class III or class IV. In the words of Perlara founder and CEO Ethan Perlstein, PhD., we look forward to scientific firsts for rare disease drug discovery. 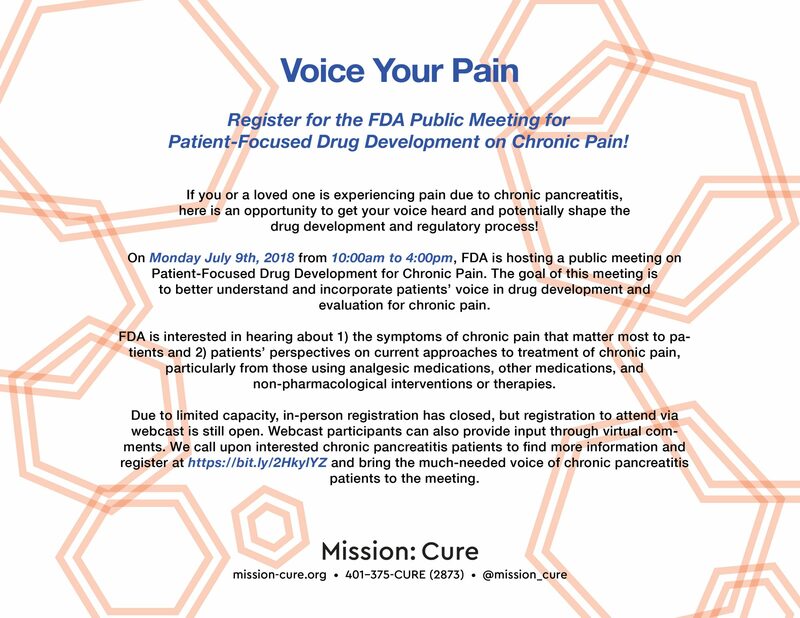 Register for the FDA Public Meeting on Chronic Pain! To register and see more information regarding the session on chronic pain, please visit: https://bit.ly/2HkylYZ. On the day of the meeting, registered patients will be able to access the webcast here. Get your voice heard: If you are unable to making the public meeting, you can still contribute through written comments on the Federal Register Notice for this meeting that will have a public docket open until September 10th, 2018. Learn more about Patient-Focused Drug Development: This meeting on chronic pain is the 26th disease-area meeting led by the FDA as an important part of its Patient-Focused Drug Development Initiative. Get involved: Mission: Cure plans to organize an Externally-led Patient-Focused Drug Development Meeting on chronic pancreatitis in the near future. If you are interested in contributing to the planning of this event, please reach out to us at info@mission-cure.org and/or subscribe to our mailing list for future updates.